You've heard that term before and seen it on pictures around the interwebs. But why? What are they? What purpose do they serve? In essence, if you're a blogger and post your own pictures, then yes. Yes you should. But we'll get to the "whys" in a second. First off, what is a watermark? Yeah that...that little tiny thing you've probably seen a million times on a million pictures- that little bit of text or image- that's that person's watermark. 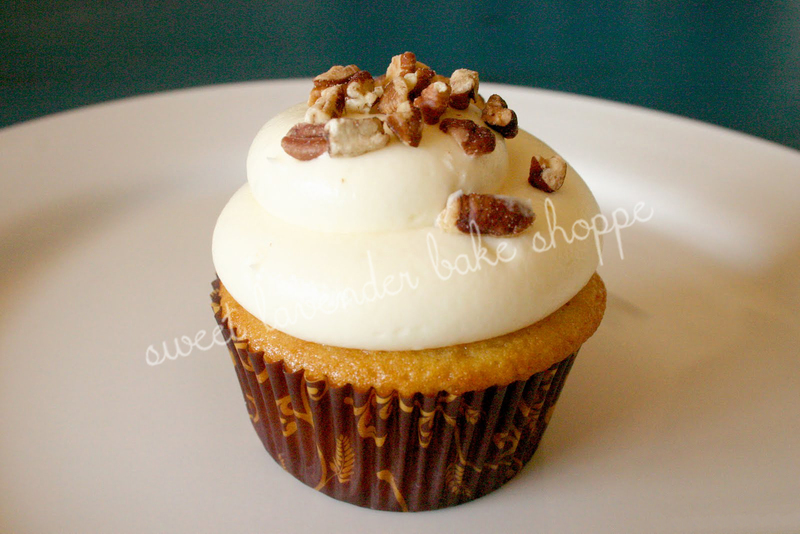 Depending on the blogger/photographer a watermark can go from simple to majorly fancy smancy. Maybe it's just the blogger's name...or maybe it's a company's logo. Doesn't matter- they're all watermarks. But why? Why are they there and most importantly- do you need one? Watermarks are there for a variety of reasons! For one, they're the photographer's way of saying, "I made this". You can even think of it as a little "property of" sign. Remember back in school when you needed to put your name on your art work before handing it in to the teacher? It showed that person that you, yes you, take responsibility for said art work and that it is indeed yours. Same thing with watermarking a photo. I mean you spent all those hours creating, photographing, and editing- why not make sure you smack your name on it and let people know it's yours? Going along with this- watermarking helps to keep with your brand (if you're doing that). Even if you're only a blogger- you should consider branding yourself- making everything "flow" and go together. 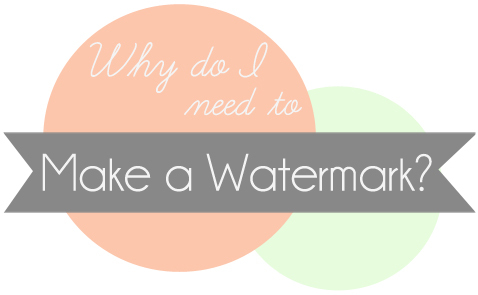 Maybe your watermark is your blog's banner. Or maybe a snippet of it. Whenever a photo is uploaded, that little watermark will add to your branding. Piggy backing off the whole "property of" thing- watermarks make it really hard for someone else to claim that photo as their own. Believe me, people will try. Watermarking each and every photo you upload to the internet at least gives yourself a chance of keeping that photo yours. And yes- you need to know that no matter where you upload a photo (Facebook, Twitter, Blogs, Instagram, Pinterest, etc) consider it available for the world to see- all 456 kwazillion people. So simply stated, a watermark protects your photo- at least to a degree. It very well could be snatched and stolen, if not claimed as yours by your watermark. 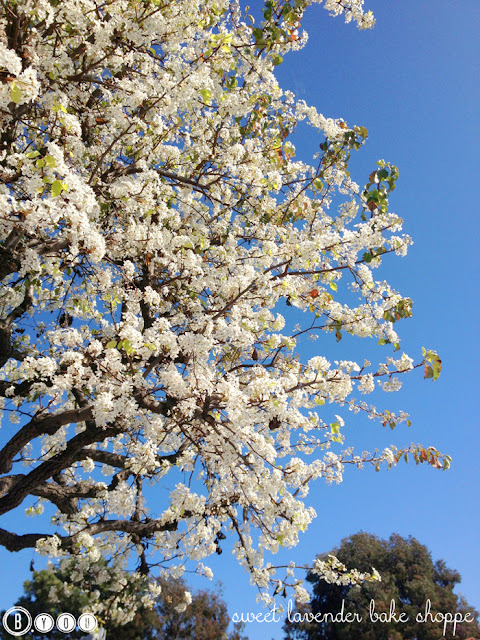 Watermarking allows whoever sees your photo to always know where the original source is. With sites like Tumblr and Pinterest running wild, and photos being shared over and over again- just like the "telephone game" a picture's original "author" can get lost, easily. By watermarking your images, no matter how many re-pins a photo has, people will always see that watermark and know where it originally came from. Neat, right? Going along with the above- always, always, always make it a point to drive people to your main source of info. Whether it be your blog, a website, or your etsy shop- by watermarking your photos that you put out there on the internet, you're helping each and every eye that sees that photo head back to your main source and find out more about you (and what you do). So, it's like free advertising in a way! We love that! 1. Simple text. Your name, placed somewhere on the side or corner- easily seen but not obstructive to the photo. See photo above. It's noticeable but not too noticeable. It's easily able to be read but doesn't take away from photo. This is also the easiest watermark to create. 2. Your logo or an image that represents you. Again off to the side or in a spot that doesn't take away from the quality of your photo. 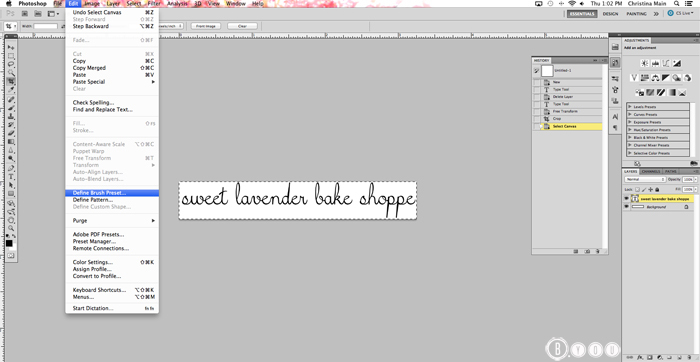 As you can see, this watermark is inspired by my branding I have running through my blog AND social media sites. We're all about branding here. Keep everything about you, fluid and concise. This watermark goes along with everything else I have and is clear, clever, and artistic. It is also placed where it doesn't take away from my photo. 3. Positioned Across: This is by far your most protective approach. If you're really nervous about stolen photos, you can always make your watermark more transparent and stick it smack across your photo- yes this will best protect your photo- those pesky thieves most likely can not edit that watermark out without distorting the image...but it in turn takes away from the image quality. So weigh it out- what matters more to you? If you are a blogger, shop owner, website haver-er (hahaha) or anyone who takes value and pride in their photos- then yes, you should consider watermarking your photo. Kevin and Amanda's blog post really shines light on picture stealing and gives you a simple "how to" in finding out if any of your pictures are being used without your consent! It deserves to be said again- your hard work- your photographing blood, sweat, and tears, if not protected- can (and most likely will) be stolen and used by someone else. Claimed as theirs! I wish I was joking. Remember when I talked about that very thing a little bit ago? Yeah- it very much happens. No one is safe. Don't let that scare you from putting your gorgeous work out there! Create a simple watermark, place it smartly on your photo, and share away! Now, I do need to state for the record- watermarking doesn't 100% guarantee that your pictures won't be stolen. Those that really have it out there to steal your photo will try to crop it so that watermark is left off. So place wisely! Make sure you put your watermark in a place that, if cropped out, will ruin the photo or make it less attractive. For me, I choose to take the chance of someone working that hard to crop my watermark off- and place in a position that doesn't take away from the quality of my image. For you, that chance might not be worth it- so like said before- you might want to position your watermark in the focal point of your picture, or in a place that's harder to remove. How do I make a watermark? I generally like to start on the bigger side of things, always. It is so much easier to shrink something to the size you need rather than try and blow it up. 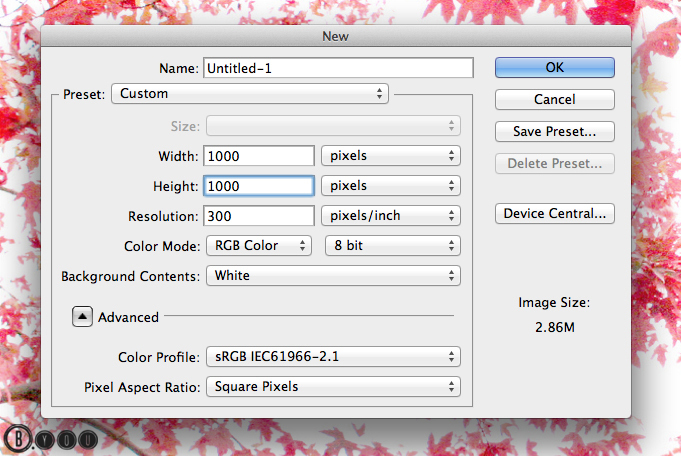 Once saved small, anything blown up will pixelate and look grainy. So, save big, edit to a smaller size if needed- always. 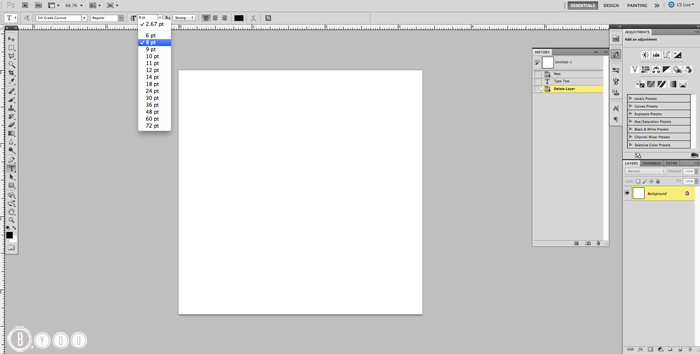 When creating new watermarks (or any other brush for that matter) I like to open a new Document at 1000x1000 pixels wide. Hit "OK" once done. 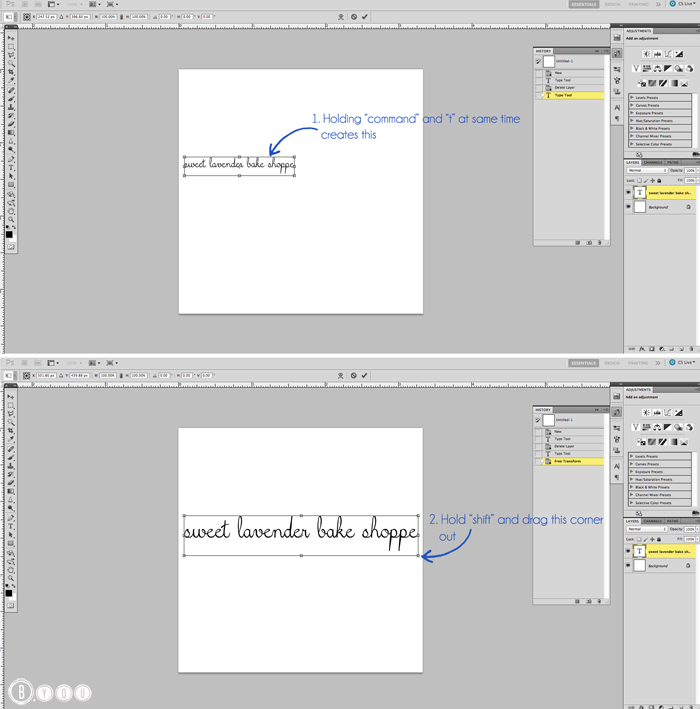 Once your new Document is opened, we can begin creating your fancy new text-based watermark! First, select the "Type" tool on the left hand tool bar. On the top you'll see your "font" box- by clicking that arrow, a menu will drop down and you can scroll through until you find a font you like best! Once you found the font you like, click it! Next we will need to change the font color- I recommend using white or black to begin with- I usually choose black. On the left hand tool bar click the "Foreground Color Box". A new window will show up. 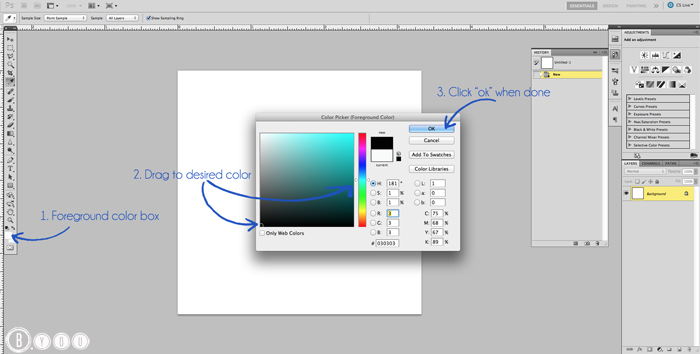 Drag your cursor to your color- again I suggest starting with white or (my preference) black! When color is chosen, click "OK". 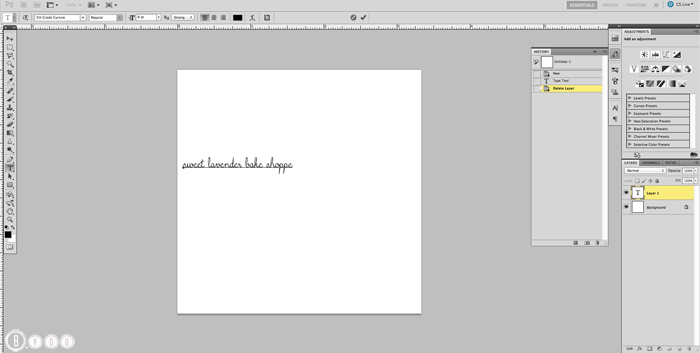 Next we will need to pick a font size- I generally like to begin with an 8-10pt font size. We will resize this later. Just click the menu at the top and find the font size you're comfy with. Now, in your white Document box, click your cursor somewhere on the left hand side. 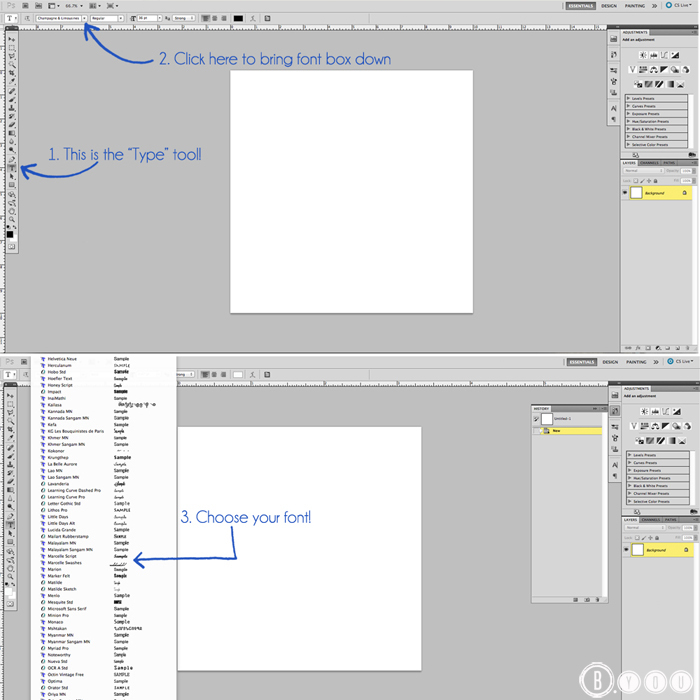 Make sure that "Type" tool on the left hand menu bar is still clicked. 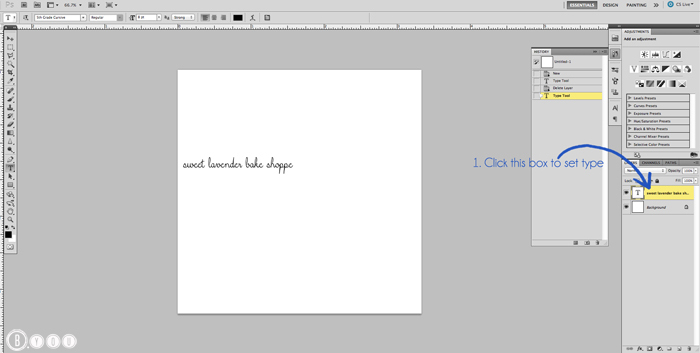 Once finished, click on the "layer 1" box on the right menu to set your text. The box should be highlighted. Now we will need to resize that text! Again on the keyboard, press and hold the "shift" button. While holing that shift button, drag your cursor to the corner of your box and drag out as far as you can go in your white document. When done, let go of mouse cursor and then "shift". 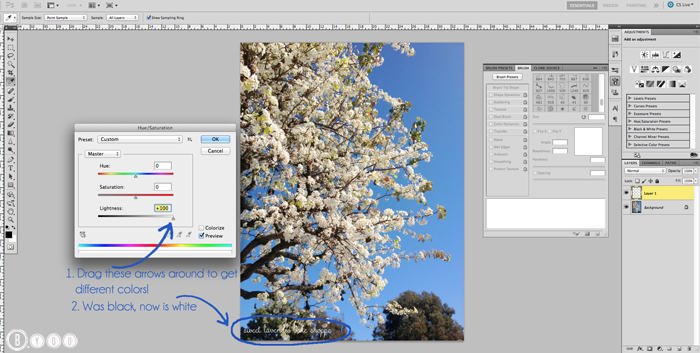 By holding the "shift" button, you can resize your picture/text at an equal proportion. If you do not hold "shift" your text/picture can resize disproportionately. If at any time you mess up, just hit "command" and "z" at the same time (ctrl and z for PC) and it will take you back one step. Hit enter when sized to your liking. This sets it. Now we are going to crop our text and get rid of all that extra space. 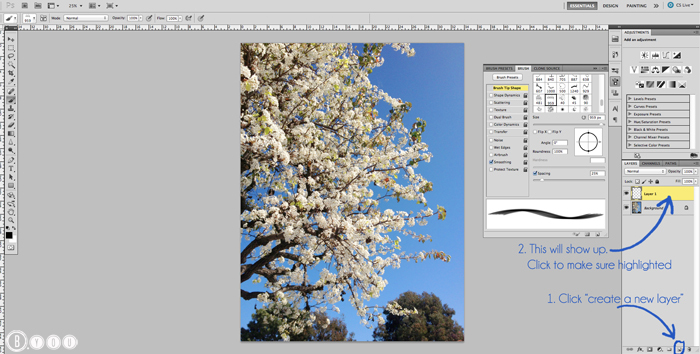 On the left hand menu, click the "crop" tool. Starting at one corner of your text, drag a box around your text, as close to the actual words as possible, without cutting anything off. You can also bring the sides in manually once this box is created OR push them out a bit if you got too close. When ready, hit "enter" on your keyboard. This will select everything you've cropped in your new box/the entire image. This creates your brush which will become your new text watermark! A window will pop up asking you to name your new brush. Go ahead and do so :) Hit "OK" when done. 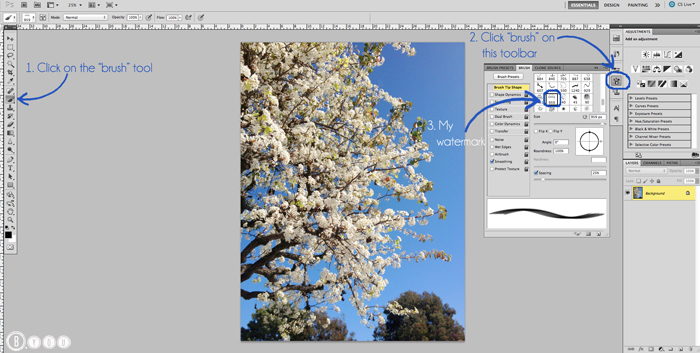 Your watermark brush is now created! Now for the fun stuff! How to actually use your watermark! Upload your photo to Photoshop. 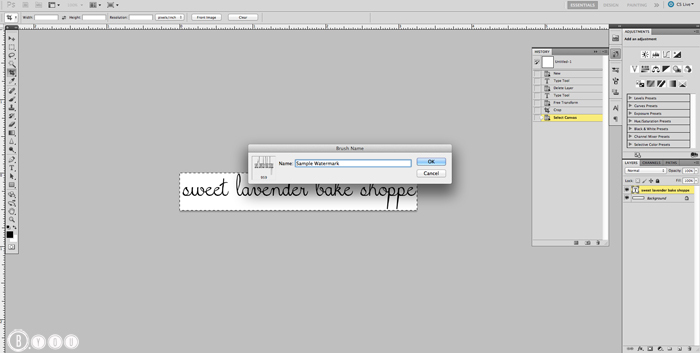 Then on the left hand menu bar click on the "brush" tool. Next, on the right hand side there will be another little menu, click on "brush". 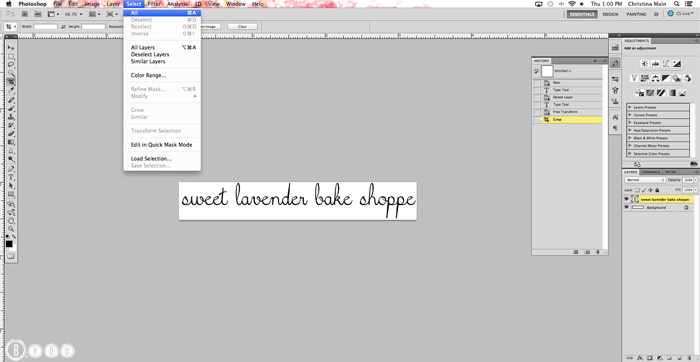 Scroll through all the possible brushes you can use for future projects ;) until you find your created watermark brush. Look closely! Once found, click it! At the bottom right you'll need to click that "create new layer" button again. By doing this you'll make sure you are creating/editing/having fun with only your watermark created. Make sure your new layer is highlighted, if it's not- click it. Now "stamp" your watermark wherever you'd like! I stamped mine at the bottom left hand corner- it's hard to see because it's black. We'll need to change this watermark to another lighter color for this particular picture. Where I wanted my watermark to be, the picture had a lot of dark colors- so black won't work. 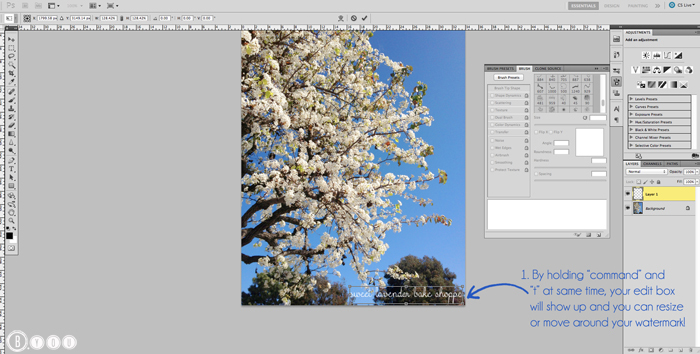 Remember- because my "foreground color" box shows black, when I "stamp" my watermark it is going to show up black. A window will show up allowing you to change that watermark color! Play around with those 3 arrows! By moving them left and right you'll see you can choose from a variety of colors! For my watermark, I simply want white. To do so just move that bottom arrow all the way to the right- or until it says "+100". Remember, if you need to move your watermark around, or resize it you can do so by simply pressing "command" and "t" at the same time on your keyboard when your watermark layer is highlighted. Holding "shift" and dragging any corner allows you to resize it, and clicking in the center of your box and dragging around allows you to move it around! When done, hit "enter"on your keyboard. Once you get this technique down, make sure you play around! 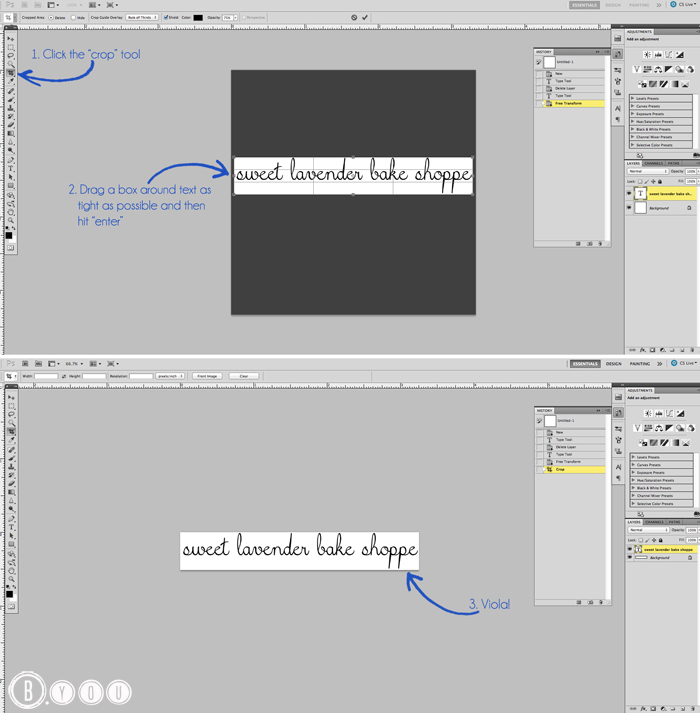 There are so many lovely things you can discover, like making a multiple font watermark or image watermark. This is also a great way to make a custom brush for arrows, little banners, fun shapes, etc. If you have an image you like, you can skip to steps 9 on and basically make the same thing. Just make sure your background of your image is transparent. Making one from scratch on Photoshop will do that for ya! Got questions? Need help? We're here to help! Just email and I'll get you back on track in no time! I've just recently learned the hard way that I need to start watermarking my stuff. Getting exposure for your work is great, but not exactly effective when a very popular FB posts it without credit. Live and learn I suppose.